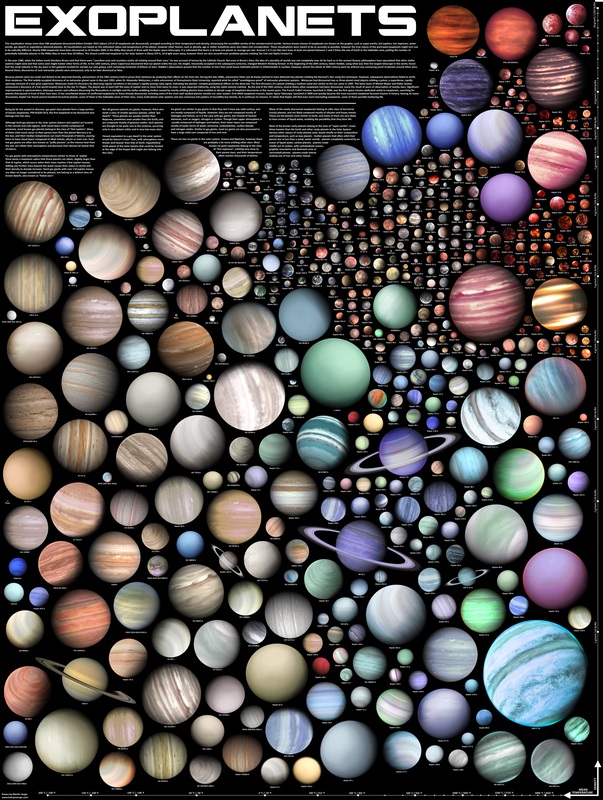 This awesome graphic shows the incredible variety of over 500 exoplanets that have been discovered between 1988 and October 2015 - although there is some contention surrounding the first exoplanet discovery. The poster, beautifully crafted by Slovakian graphic artist and writer Martin Vargic, shows around one-quarter of the so far confirmed exoplanets, all painstakingly arranged by their temperature and density. The visualization is based on the radius and temperature of the exoplanets, although other factors – such as density, age or stellar metallicity – were also taken into consideration. From left to right, the exoplanets increase in temperature, while from bottom to top, the exoplanets increase in density. All of the known classes of exoplanets are represented in the graphic, such as super-Earths, hot Jupiters, hot Neptunes, water worlds, gas dwarfs or superdense diamond planets. The visualizations were made as accurately as possible (in terms of their scale and color), but their true nature could always turn out to be wrong as we learn about them. Perhaps what’s most exciting about exoplanets is the possibility they harbor life. Provided they’re in the “Goldilocks” zone around their host stars – which is neither too hot nor too cold for liquid water on the surface – there’s a chance that alien life could form, although we know the habitability of a planet is a bit more complicated than the presence or absence of liquid water. What&apos;s more crazy to think about is the possibility that the universe has barely even started creating exoplanets. Recent estimates from NASA and Kepler space telescopes suggest 92% of potentially habitable planets in the universe are yet to be born. Looks like this poster in a trillion years might have to be A LOT bigger. You can check out the full, larger image here.